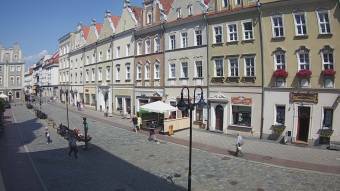 It's 11:02 in Opole, Poland right now. City View Moving Image Stream with a vew of the city center of Opole. Rybnik: Rybnik Marketplace, 47.9 miles away. Filipovice: HD-Livestream Filipovice, 48.5 miles away. Piekary Slaskie: ul. Bytomska, 48.5 miles away. Wroclaw: Old Town, 49 miles away. Ramzova: Live View, 50.1 miles away. Cervenohorske sedlo: Landscape View, 50.7 miles away. Malá Morávka: Kopřivná, 52.6 miles away. Malá Morávka: Praděd - Ovčárna, 52.6 miles away.